Some high school students in Colorado may get prime jobs even before they get their diplomas. That’s because CareerWise, the nation’s first statewide youth apprenticeship program, links students to industries and addresses manufacturers’ demand for skills, while offering employment, academic credit and support for college. Hari Sreenivasan reports as part of our Rethinking College series. 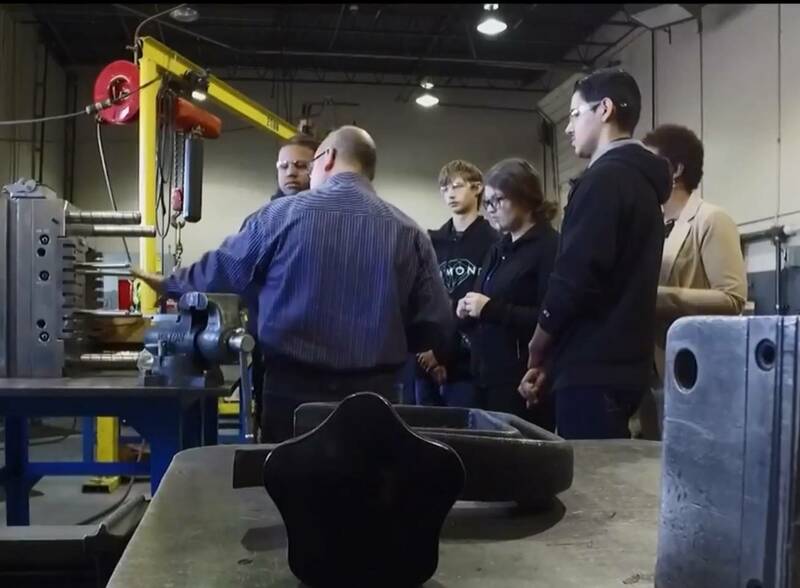 MILES O’BRIEN: Next, we continue our series Rethinking College, with a look at the nation’s first statewide youth apprenticeship program. As Hari Sreenivasan reports, it offers high school and college credit and pays students for their work. This story is part of our weekly education segment, Making the Grade. HARI SREENIVASAN: In Colorado, this factory floor may be the classroom of the future. MAN: This goes into that hopper, gets melted back into a liquid, as it goes through the machine. HARI SREENIVASAN: And these students may be hired for prime jobs before they even finish high school. Manufacturers like Intertech Plastics in Denver are facing critical shortages of skilled labor, and they want to teach teens how to work for them. NOEL GINSBURG, CEO, Intertech Plastics: We couldn’t support the growth in both facilities because we didn’t have the people. HARI SREENIVASAN: Noel Ginsburg is the CEO. NOEL GINSBURG: From the day I started the company to this day, the biggest challenge we have was around having the right people with the skills we needed to grow the business. We have 40,000 unfilled tech jobs in Colorado. College is not cheap, right? So, if you could earn up to 40 to 50 credit hours for college by working in a business like this, and get paid, and get your high school diploma, who wouldn’t want to do that? It’s a pretty cool deal. HARI SREENIVASAN: Colorado’s governor, John Hickenlooper, is behind the idea. GOV. JOHN HICKENLOOPER, D-Colo.: We are one of the fastest growing economies in the country. You can’t sustain that without talent. And it is a global competition for talent now. And a lot of that talent, it’s not Ph.D.s and the superstars. A lot of that talent is middle skills. HARI SREENIVASAN: Partnering with the state, Ginsburg founded CareerWise, an apprenticeship program that links Colorado industries and school districts. Starting this year, high school Jr.s and seniors can spend three school days a week as on-the-job apprentices, earning classroom credit and a paycheck. NOEL GINSBURG: We’d like to have 230 career paths that will, in 10 years, serve 20,000 young people in a whole host of careers, from banking and finance to advanced manufacturing. HARI SREENIVASAN: Colorado leaders believe they are in the forefront of addressing what economists call a middle skills gap, unfilled jobs that require more than high school, but less than a four-year college degree. GOV. JOHN HICKENLOOPER: For more than 30 years, we took on this challenge that we were going to make sure every kid went to college, and this was the only solution. But we have barely nudged the needle in terms of how many kids actually go to college and graduate. And in that sense, I think it’s been a failure. NOEL GINSBURG: I was part of that mantra, saying everybody should go to college. The reality of it is, that’s never going to happen. In this country, what the percentages? Twenty-eight percent, at best, will get a four-year degree in this country. So, we’re essentially telling everybody else that they can’t be successful in our economy and in our country. And it’s simply not true. HARI SREENIVASAN: After graduating high school, the program offers apprentices full-time employment and financial support toward community colleges degrees. The pitch convinced visiting high school student Kevin Roquemore to add another choice to his career path. So, what are you going to do after you graduate high school? What are you thinking right now? KEVIN ROQUEMORE, Student: So I have a plan A, plan B. Plan A hopefully is to go to the Major Leagues, just if I don’t go to college, play baseball. HARI SREENIVASAN: OK, I don’t know your athletic skill, but let’s just say the baseball career stops in high school. What are you going to do? KEVIN ROQUEMORE, High school student: My plan B was to be in manufacturing and engineering. HARI SREENIVASAN: Alejandro Garcia’s parents were thrilled to hear he was accepted into the program. JOSEFINA SANTUARIO, Mother of Alejandro Garcia, high school student (through interpreter): We preferred him to attend university. That’s what we wanted. But when we heard of this opportunity, we jumped straight on it. HARI SREENIVASAN: But will schools become training grounds for industry? Will apprentices miss out on crucial classroom learning? The idea that critical thinking and kind of the long-term life lessons that you pick up being in an academic environment, those are necessary too. NOEL GINSBURG: They are, but what I believe is that those skills can be learned in the workplace, because the workplace is real, and you have different personalities. I think soft skills are better taught in business, not in the classroom. HARI SREENIVASAN: Looking to fine-tune their apprentice program, Colorado leaders traveled to Switzerland, where 40 percent of companies offer student apprenticeships. MAN: So, why apprenticeship? Swiss firms do not only train because it’s a tradition. There is an economic rationale. MAN: It is an investment into young people for making sure that we have a low unemployment rate. HARI SREENIVASAN: Suzi LeVine, former U.S. ambassador to Switzerland, hosted the delegation and is now working with Colorado’s CareerWise apprentice program. SUZI LEVINE, Former U.S. Ambassador to Switzerland: We’re at the front end of an apprenticeship renaissance in the United States. When you look back at Hamilton and Franklin, started out as apprentices. In Switzerland, two-thirds of young people go into apprenticeship. Their youth unemployment is just 3.2 percent. We need that here in the United States. GAIL MELLOW, President, La Guardia Community College: I think what Colorado is doing is a great first step. HARI SREENIVASAN: Gail Mellow is the president of New York’s La Guardia Community College, which also offers programs that link high school students to middle skills. While enthusiastic about Colorado’s new program, Mellow cautions that Europe and the United States have very different social structures. GAIL MELLOW: The challenge is that if we model those steps exactly at what happens in Switzerland, we don’t have the robust safety net. So, our robust health benefits, the living wages, those are often not part of American businesses. HARI SREENIVASAN: And she’s concerned that apprenticeships could lead to short-lived jobs that improved technology could eventually wipe out. That it’s not a dead-end job? GOV. JOHN HICKENLOOPER: It’s a job that’s going to lead to a better job, that will lead to a better job. That’s what we used to call a career.